You can easily learn how to read guitar tab without any knowledge of classical music notation. After all, when guitarists are learning the chords and lead for a song, they just need to know where to put their fingers. We'll start with a few examples to get you familiar with the tab diagrams. Oh, by the way, tab is short for tablature! 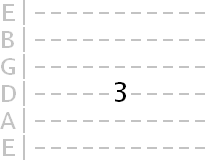 This is the fretboard position (labelled with fret numbers) that tab diagrams mimic. It's the sequence of the strings we're interested in - skinny string at the top (1st string), fat string at the bottom (6th string). That's a typical blank tab diagram labelled with the string numbers and their tuning. 0 indicates an open string, which means you play that string as it is, without fretting it. In the tab above, we'd play the 1st string open. This 0 can apply to any string and, when noted on the tab diagram, it simply means you do not need to fret that particular string, since the desired note is created by the open string. So in this example we're fretting the 4th (D) string at the 3rd fret. 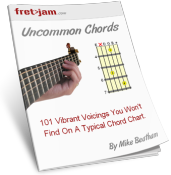 We're going to look at a tabbed guitar scale (specifically, A minor pentatonic). Tab doesn't tell us anything about which fingers we use to fret each note, but you'll pick that up when you move on to learn individual scales. Timing and speed is also up to you, although in a lot of cases, you'll be using tab as a reference for a song you already know quite well, so you'll have an idea of the timing and speed required. If it's a scale exercise, it's best to start slow and speed up gradually using a metronome. 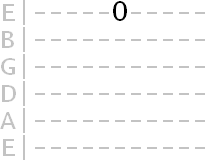 When you see the fret numbers in a vertical line like this, it means play them together, simultaneously. Remember, the 0 means play the string open. If no fret number is marked on a string, it simply means don't play that string. The above chord uses all six strings. Incidentally, that was an E major chord in tab form which you may recognise from the basic chords lesson. The tab doesn't tell you how long to play each chord, or how many times to strum it before you change to the next chord. Again, this is something you'll need to figure out. There we can see an arpeggiated E major chord followed by a strummed E major chord. 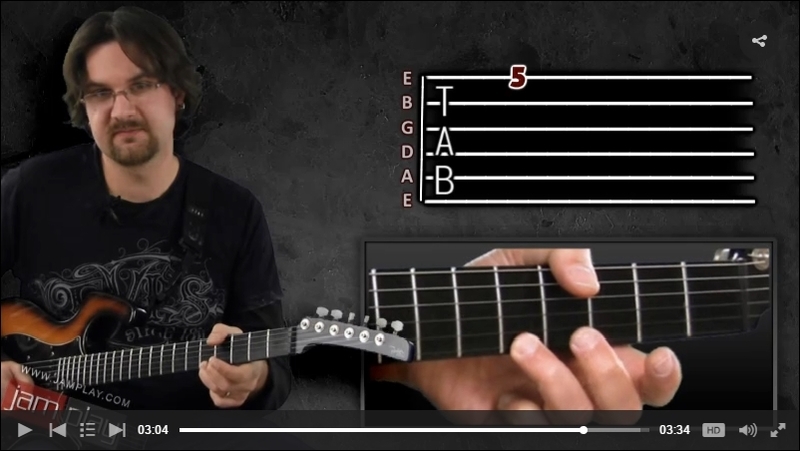 Hopefully, you should now be comfortable with the basics of how to read guitar tab! Tab is very versatile and lead guitarists use several symbols to refer to certain physical playing techniques (such as h for hammer-ons, p for pull-offs, b for bends etc.). As you progress into lead playing, visit my lead guitar section where this lesson will be expanded on, looking at the special symbols used in lead guitar tablature.